Three weeks till the Isle of Wight Marathon, five weeks till the Seaford half marathon. Yesterday afternoon I ran in pleasant sunshine to Frog Firle and High and Over, on the longer route. A short run, as one of the group was recovering from a very successful London Marathon. After a grey day, brightness came in late afternoon, so I took advantage of it for a run to the front and along to the base of Seaford Head. The kittiwake colony was noisy but there were no dolphins, I fear. I was slow, but that's to be expected after a long run the previous day. It being marathon day, it seemed only right to do a long-ish run, so I did 16 miles, to Newhaven, held up briefly by the swing bridge, then along the Ouse Valley Way, up Itford and Beddingham Hills, though the new bridge over the A26 is not yet open, to Firle Beacon and home to Seaford. Nature notes: a heron, plovers, two egrets, though whether the cattle or little types I could not tell. Four weeks till the Isle of Wight Marathon, six weeks till the Seaford half marathon. I went back to Stanmer Park by kind invitation of the people I used to work with. One, Claire Brooks is in the London Marathon in two days time. Also running on Sunday is Abigail Woods, who gave the 2003 Bishop and Lefanu lecture on her research on the history of the control of foot and mouth disease. Good luck to them, and everybody else. I had a mid-morning run to Splash Point in grey and uninspiring weather. In this morning's post the entry form came for the 2006 Beachy Head Marathon, to be held on 28 October. I shall certainly enter, and hope to improve on last year's time of 4:51:54. I've been away for a while, so this post must combine three runs. Run 1: in Cambridge, I went out to Haslingfield on Easter Sunday morning, ran a circuit of the village, and back. It was cloudy. Run 3: back home, I ran a short way down to the sea and back on a sunny evening. 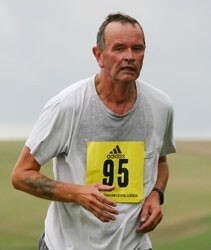 Five weeks till the Isle of Wight Marathon, seven weeks till the Seaford half marathon. I ran again, to try to get myself back into regular training. It was a pleasant afternoon run over the downs to Firle Beacon and back. There had been snow in the morning which had melted but could still be seen on the hills to the north.